In Copenhagen, now the weather is up and down, one day is 23 degrees and another day 16 degrees. This is my second summer here and I’m actually fell lucky to enjoy this weather, after the long winter. I believe that a Tofu Udon Noodle soup is perfect for this weather. I usually have all the ingredients in my kitchen so I can prepare it. wild garlic (we found wild but you can use any green leaves vegetables that you like as garnish, (chives, pak-choy) raw, lightly fry or blanched. Soak the bonito and the kombo seaweed half hour before starting. Begin to prepare dashi: put water into the pot with bonito flakes and Kombo seaweed bring slowly to the boil until 65 degrees and when it´s boiling remove kombo seaweed, otherwise they become bitter. Add the dark soy souce and Mirin to the dashi until dark colour, with a little sweetness from mirin and saltness from soy sauce, add also some salt to get a nice seasoning. bring to a boil and keep it warm. Warm up some water for cook the Udon noddles, in the meantime cook the eggs in a boiling water for 8 minutes and cool it down. Heat sunflower oil in saucepan over medium-high heat, add the cubed tofu caramelising. keep warm. Lightly fry the wild garlic and cook the noodle in a salty boiling water until cooked, (approximately 4 minutes) then mix in a bowl with a bit of sunflower oil to don´t let it stick to each other. 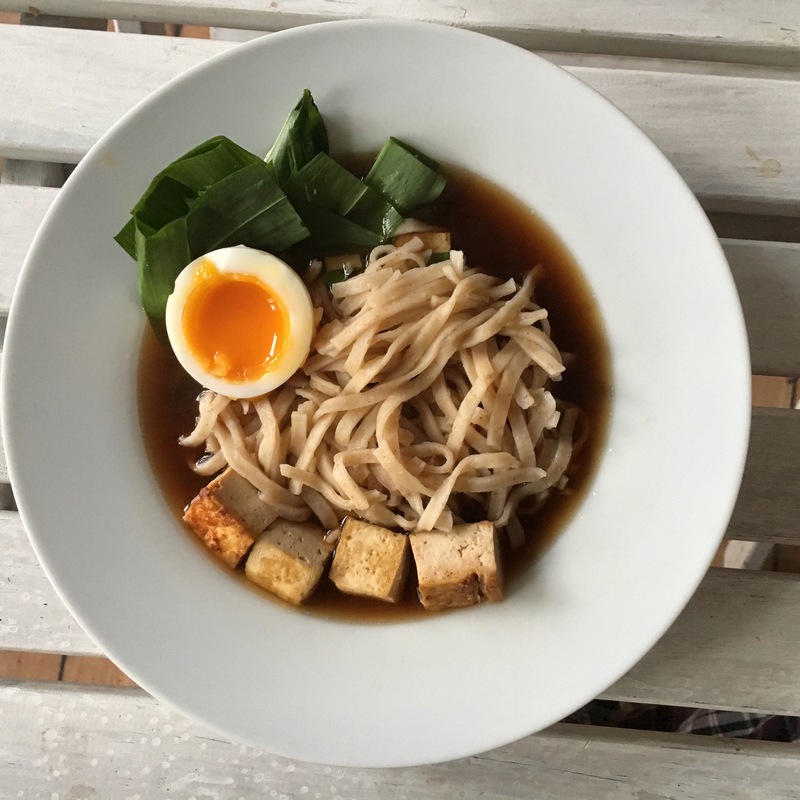 In a bowl put your noodle, with half – peeled egg, wild garlic and cover with the udon soup.